This last week saw some interesting fishing. There were some hot days at Thrasher then some dead days, only to have some hot days down at Porlier and then some slow days. There were also some red hot days at Roger Curtis followed by a few dead days and some good to great days at QA. So in all of these spots there are fish, but as usual, they are moving around a lot. The fishing really is changing day by day, from hot to not. Keep in mind that just because it was hot or cold at one spot on one day doesn’t mean it will be that way the next. So where to go? If the wind is light to moderate, it is hard not to go to Thrasher this time of year. That being said, we didn’t go there on Sunday this past week even though we could have, and we had much better fishing off S. Bowen from Roger Curtis to Cowan. So you never know. Confused yet? It gets worse. Or better depending on how you look at it. 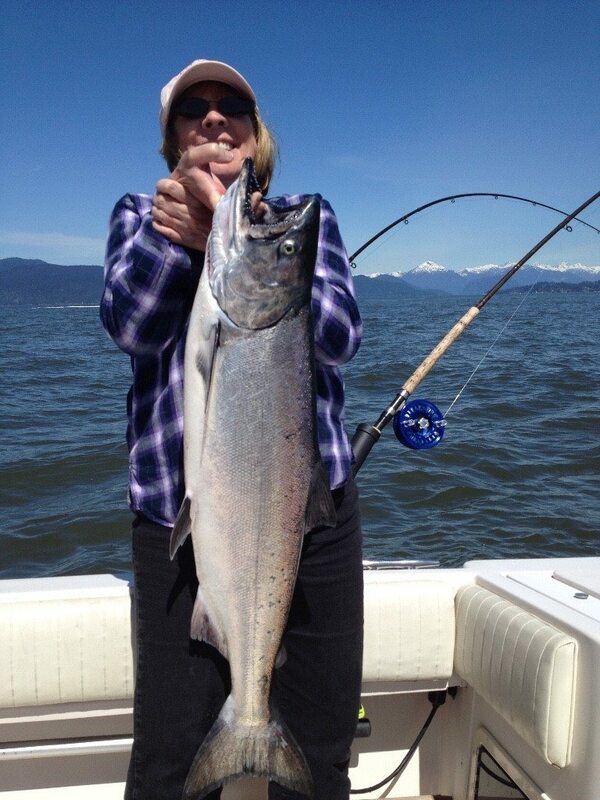 There are also fish up Howe Sound at Hole in the Wall. So you really do have a lot of options. So the best thing to do is look at how much time you have, look at the winds and tides, and pick the spot that best suites your needs and your vessel. On a more recent note, there wasn’t much fishing pressure mid week because of the huge winds and the big tides didn’t help either. 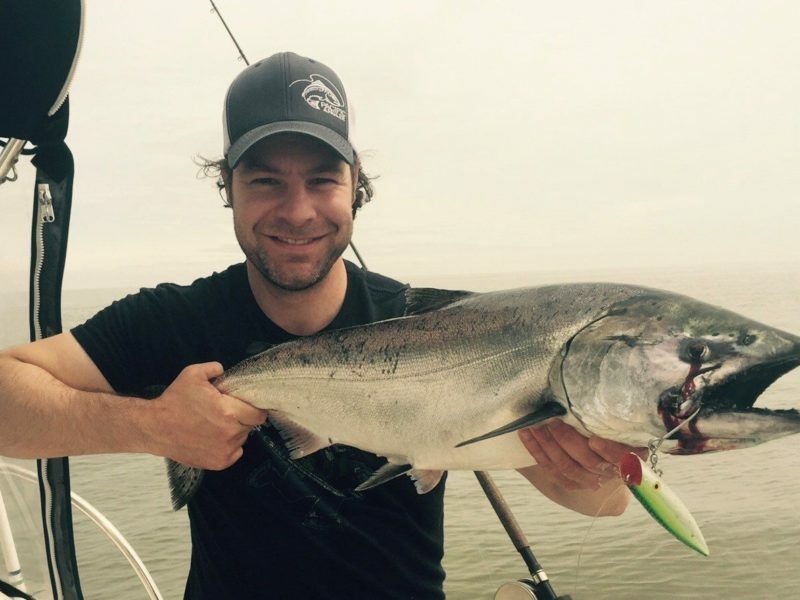 With lighter winds forecasted for this weekend and the tides starting to mellow out later next week, I think fishing will start to pick up on the weekend and continue to be good into late May and early June. In terms of what has been working, not too much has changed from the previous weeks reports. Visit last week’s report for a picture of productive spoons, teaser heads and hootchies. Keep an eye on the water colour for an indication of what depth to fish. In dirty water that is coloured by the Fraser, the fish are 60-120 on the riggers. In clear water they are much deeper, 120-175. Finally, you may remember Andre’s report on fishing Tomic Plugs from a few weeks back. 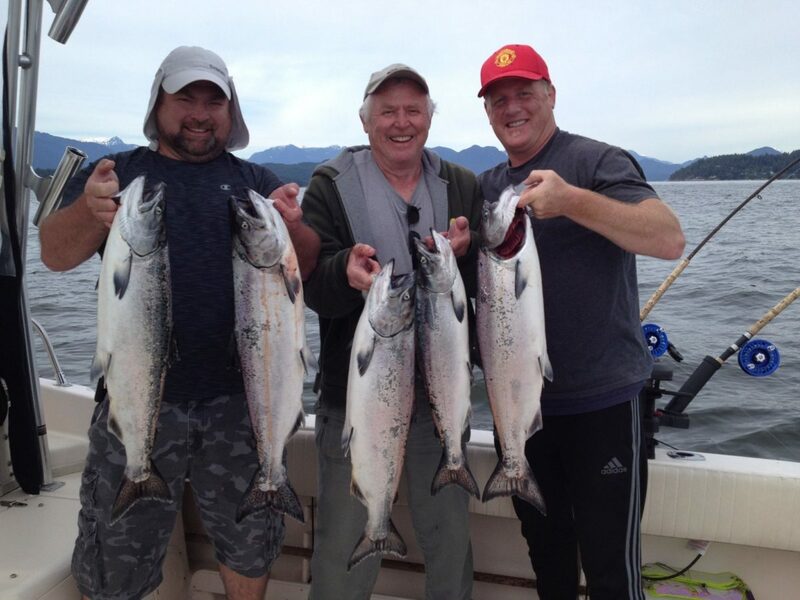 Customer Kevin had great success fishing plugs! Nice fish Kevin.